Elvis would occasionally play a tune on his guitar while hanging around (contrary to popular opinion, he wasn't at all bad on the instrument—it was his solid rhythm, after all, that drove the early Sun recordings, a fact sadly forgotten by many commentators!). Peter Gunn seems to have been a particularly popular "filler" and the 1968 recording is just the first of several versions available. The original music was the theme tune to a very popular TV show called, surprise surprise, "Peter Gunn" starring Craig Stevens and Lola Albright—who later appeared in Elvis's "Kid Galahad." 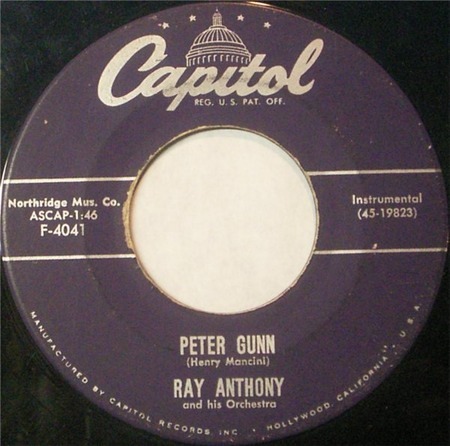 Henry Mancini, who composed the number, played the TV theme, which he recorded on 26 August 1958, but Ray Anthony recorded his original version three weeks earlier on 4 August, releasing it on Capitol 4041. Pop guitarist Duane Eddy had a big hit in 1960 with the number and the tune has been recorded and re-recorded many times since.